The Keil MDK-ARM Development Tools download includes several example programs that are configured for the Keil MCBSTM32F200 Board. STM32F207 RAM - where the program runs in internal RAM. STM32F207 Flash - where the program runs from internal Flash. Abstract.txt contains a short description of the example. startup_stm32f2xx.s contains the startup code for the microcontroller. system_stm32f2xx.c contains the system initialization code for the microcontroller. \KEIL\ARM\BOARDS\KEIL\MCBSTM32F200\ for the MCBSTM32F200 board. \KEIL\ARM\BOARDS\KEIL\MCBSTM32F400\ for the MCBSTM32F400 board. The Blinky project is a simple example that demonstrates configuring and controlling multiple GPIO ports to blink the on-board LEDs sequentially. SysTimer is used in interrupt mode and ticks every 10ms which toggle the LED flash sequence. In uVision V5, click the Pack Installer icon. 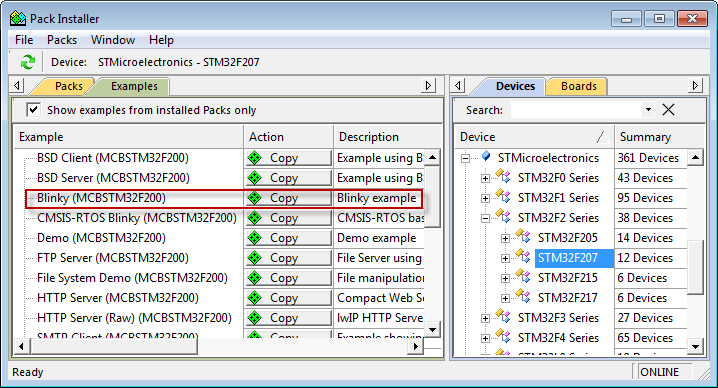 Click the Examples tab, and locate the Blinky (MCBSTM32F200) example. Click the Copy button to copy the example project to a folder of your choice. The checkboxes retain example project folder structure and open the project in a new instance of uVision.